Like the rest of the sites occupied by the Incas in the Urubamba River, near Machu Picchu, in the Intiwatana area there are sidewalks, grounds and ceremonial sites with stone sculptures. The Urubamba river in its route to Machu Picchu bends that aligns with the area that is obtained the water for central facilities. In the 121 km of the railroad agricultural platforms and ceremonial complex are located. In the lower part of the slope occupied by the archaeological site, the farmers know the name of the hill as "El Calvario” has traced the development of the railway which forms a zig-zag to save excessive slope. Down of the railway are the extensive facilities of the Electricity Generation Company in Machu Picchu. 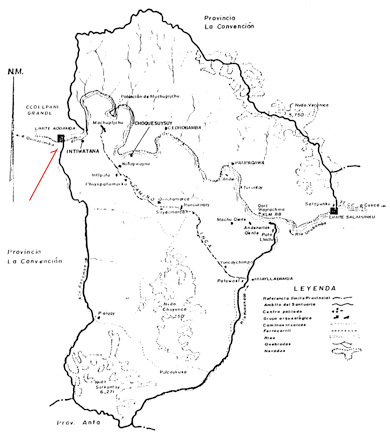 The area described is situated on the left bank of the Urubamba River, which later receives waters of the stream Aobamba. The place was visited by travelers and members of the scientific expedition that led Hiram Bingham, who made the first scientific recognition site. The agricultural terraces were always used by the farmers settled in the area, who probably looted existing graves at the site, long before the arrival of that expedition. It is a very poorly documented testimony prehispanico which there are almost no references. The site is enclosed by steep slopes that descend to the river. To the west side are the Llactapata and Puncuyoc hills to the north Cerro San Cristobal, on the right bank of the Urubamba River and the east side hill called Yucaypata. In that frame of topography it stands on the east side, in the upper part of the slope, a sort of rocky promontory known as Yanacaca. That lytic formation seen in the distance as the silhouette of the head of a flame and is located just in a place that is observed from the Intiwatana of Machu Picchu. It is likely that natural element triggered the creation of the ceremonial sector we describe, which has been chosen so as to have direct toward the back of Machupicchu visual. The site can be seen in the distance the pyramid promontory where the Intiwatana of Machu Picchu is located, showing a room with two windows and stepped platforms. 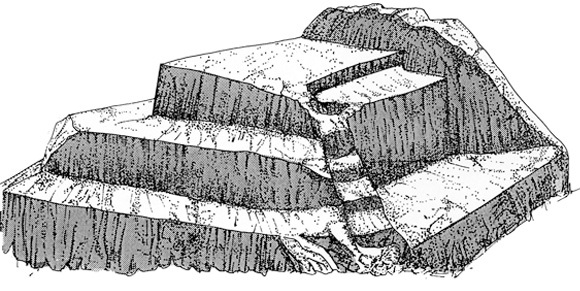 The Incas gave sculptural outcrops of rocks that were in the places they recognized a magical or religious forms. In this case the hard granite rock sculpted masterfully to express the complex symbolism of the Tawantinsuyo worldview. Attached to the slope of the hill it is located the source of ceremonial face to the North East, as well as the ceremonial seats and pyramid sculpture located a few meters away, forming a set of ritual use facing the rising sun. In the same orientation coincides with the location of pyramidal mound of Machu Picchu, visible in the distance. The source has been shaped like a block of granite rock flat and vertical, four meters long and one meter sixty to eighty centimeters high and just wide. It has been carved on a outcrop of rock by matching its middle channel, also carved in the stone, which allows access of water then leaves four suppliers cut into the face of the stone, as openings runs equidistant two feet each other. This lytic volume occupies the central part of sacred space and was the main shrine. Masterfully sculpture provides, thanks to the play of light and shadow that accentuate their geometric design, the vision of a phased sign of deep significance in Inca iconography. The stepped sign is linked to lightning, Illapa, which in turn is associated with water divinity. However, the face of the sculpture that receives sunlight in the morning is a truncated triangle geometric shape that could be related to the worship of Punchao, the divinity of the day. 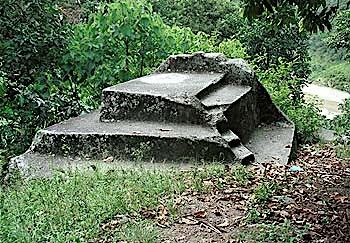 To the East side of the sculpture, it exists on a carved rock with curved staircases platform, which are descending into a ravine cut vertically. This concave size received the water that ran the ceremonial source and derived to fall like a veil on the vertical section of the creek. The use and function of this sculpture, and his real name in Inca times is unknown to us yet, because they have done work ethno-historical and archaeological research. Thanks to the quality of the stone material on which it has carved sculpture, his condition is good, although regrettable neglect of the site is devoid of a direct and convenient access. 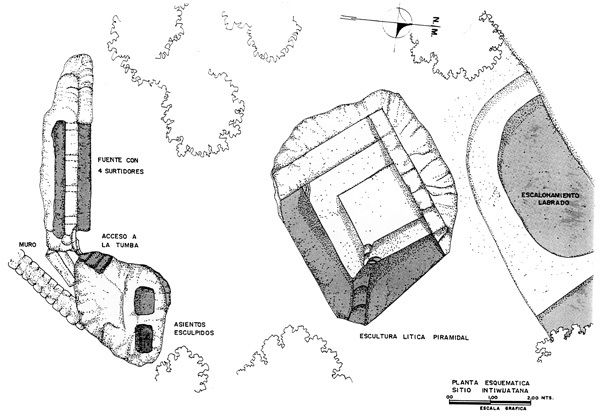 The presence of the elements indicated performs a ritual, calendrical timing and function in various sectors of the urban complex of Machu Picchu. The archaeoastronomical studies can give an interpretation on an astronomical connection between the ceremonial center of Machu Picchu and this IINTIWATANA Aobamba.